The Wells at Vineyard project is making progress, with all of the planned groundwater wells currently under construction. This project includes developing three new groundwater wells and installing a three-mile pipeline in Vineyard City, as part of the larger CUWCD Water Development Project (CWP). Having already successfully constructed five other wells, the CWP water supply has proven to be high-quality drinking water, winning Best of Show in the AWWA Intermountain Section’s water taste test two years in a row. 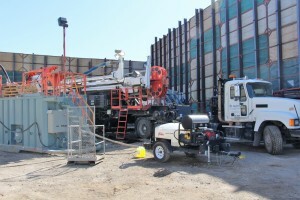 With eight wells now constructed, along with more than 23 miles of transmission pipelines, 10 million gallons of storage, pump stations and chlorination facilities, CUWCD is delivering on its promise to provide drinking water to the cities of Vineyard, Lehi, Saratoga Springs and Eagle Mountain, and to the Jordan Valley Water Conservancy District. If you find yourself wondering how exactly that water makes its way from the ground up to you, take a look behind the scenes of The Wells at Vineyard project and find out!